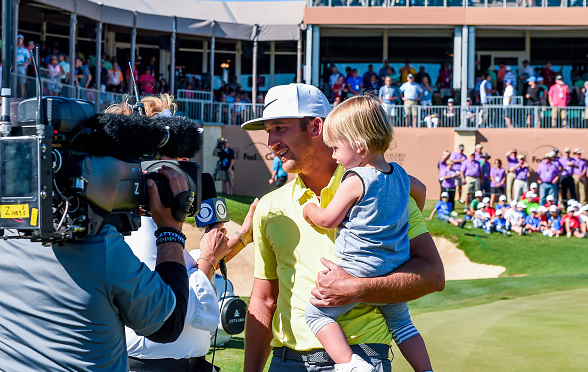 Following his very first PGA Tour win, newly-minted Valero Texas Open champion Kevin Chappell answered some questions from the assembled media at TPC San Antonio. Here’s a transcript of the press conference. MODERATOR: I’d like to welcome the winner of the 2017 Valero Texas Open, Kevin Chappell. Kevin, I’m sure I’m the one millionth person to congratulate you on your first PGA TOUR victory. As you said on the green, that is an monstrous monkey off your back. You move to 21st in the FedExCup standings, got the exemption, so forth, but if you just want to elaborate a little about that monkey being off the back. KEVIN CHAPPELL: Just a big relief for me. I don’t have to answer that question anymore. Feel like I have a base to kind of jump off from with my career moving forward. Couldn’t happen at a better place for me. Just hit me that this was my first ever PGA TOUR start was Valero Texas Open back in 2008, I believe, and you know, so very special to me this event, and I mentioned it a few times have a runner-up here and definitely had me motivated to get a win here. QUESTION: Kevin, I was here in 2012 when you came in 2nd and it was so emotional to you at that time. I mean how did you keep yourself together down the stretch here? Were you thinking about that, channeling any of that? CHAPPELL: 2011. I don’t mean to correct you. Definitely, that’s what keeps me coming back. I felt like I had some unfinished business here and, you know, there’s a lot of positives for me with this event, just one of the best run events we have all year. It’s a course that really fits my eye. It’s great for my family, getting to stay at the resort here and, you know, they’re giving away 500 FedExCup Points. Those were the things that keep me motivated and key me coming back here. QUESTION: Kevin, I think you may be wrong here. Took the lead fairly early today. How did you feel about being, all of a sudden, the hunted rather than the hunter? CHAPPELL: I don’t think I ever lost the lead but I think that was calming to me knowing that the ball was — I always had the ball in my hand. Unfortunate to make bogey on 15. It’s a swing hole on this golf course. One of only two holes in the last four — last five that play or I guess — the only par 4 that plays into the wind in the finishing stretch there, and I knew if I could got that ball down it was game, set, match because it would have been hard for those guys to get to 12. I still had 17 and 18 to play. I think I showed a little bit of emotion on 16. That’s a big shot, make 3 at worse there, hopefully roll in the 2. Then I knew I had two good chances on 17 and 18. QUESTION: You do much scoreboard watching today? CHAPPELL: I was aware all day. I kind — when I walked to 14 green I knew that I had 8 1/2 feet or whatever to get to 12 which was going to be a tough score to get to. I was also fortunate those guys were — Brooks was so far ahead of me, I was aware of what was going on. QUESTION: Kevin, with all your close calls in the last couple of years and being near the top, is there anything that you did to prepare today versus those other times? Did you do anything last night that was different than the previous attempts? CHAPPELL: Really I’ve been at ease all week. This tournament putts me at ease. I finished a little practice session last night, met the family for a quick dinner. They were already done. Scarfed my food down, had a margarita. Had to put the kids to bed. That’s been the biggest thing of my success as of late, golf doesn’t really matter. I’ve become a dad and there’s my priorities and at times probably too much of a priority and it affects my golf game but, as of last night it was just get them to bed and I was asleep by 9:00. QUESTION: Kevin, how much easier did the course play today as opposed to yesterday when it was blustery and colder, how many shots would you say? CHAPPELL: It was probably two, three shots. I don’t know what the stroke average was but every shot out there tests you and even you get 1 and 11 downwind and it’s kind of hard to hit the green. You got to hit a really good shot to get the ball on the surface. QUESTION: Sounds like you’re happy then that this — it was fitting that this was the tournament where you broke through finally. CHAPPELL: Yeah. I mean it’s special because it was my first start and to get it here, get the job done here means a lot, especially it being my first start and my first close call. QUESTION: Kevin, how would you describe your composure today, talked to Joe after the round, he said he was very impressed with the way — how you held your composure the entire day, never really panicked or got discouraged at all at any point? CHAPPELL: I was very much at ease out there. It helps. I got off to a good start striking the ball. Ball was coming out in the middle of the face, going in the direction I wanted it to. That always tends to put me at ease. And, you know, the only time I really could have freaked out today would have been on 15 and, like I said, I knew that 12 was the number. I knew that was the number to get to and I knew I had some scoring holes coming up. QUESTION: Can you talk about 17, though, because that seemed to be a putt that you would have got to 12 at that point. CHAPPELL: Yeah. I mean if I — if I probably wasn’t in that situation, if I was playing some golf with some buddies I probably hit a chip shot there, don’t putt it from the fringe. Under the circumstances, with it downwind, downhill, the area where I had to land that shot if I were to pitch it was so small and also I hit it 18 feet left of the hole but I probably was only two feet of speed off. Hit it a little hard, doesn’t go so far left and gets down closer to the hole. Kind of an unfortunate spot for that ball to end up. Again, I had the cards in my hand. I had two birdie holes to play and I didn’t have to force that issue there. QUESTION: On 18, Branden hit in front of you. Hit over the top of the flag. Did that make you anxious at all about what you were going to hit there? CHAPPELL: No. We had a good number. It was actually the last shot I hit on the range was 88-yard shot and kind of, you know, ironic I guess that it ended up being the last iron shot I hit of the day as well. What scared me the most when it was in the air the crowd was making a noise and ooh, this thing is going to fly in the back bunker is what it felt like. It landed on the green. Okay, here we go. QUESTION: Going with that final putt, can you describe the nerves, how difficult was the final putt and can you describe the nerves? CHAPPELL: I definitely had more nerves. I think I was able to pull from some past experiences on that putt. Had what felt like a putt to win at Bay Hill last year, left it about six feet short. Had a putt to win at the Tour Championship and left that about 4 feet short. Luckily I only had 8 feet. I wasn’t going to live it short. I told myself, “Hit the best putt you can and we’ll see what happens.” It looked high for a long time but I think got there in that left edge and I was excited. QUESTION: That was my question, too. I’ll pass. Two questions for you, Kevin. Going forward, how will this make you a different golfer or will it make you a if different golfer? CHAPPELL: I quite like the golfer I am right now. But, you know, it allows me even more so to make a schedule. Make it to the Tour Championship last year was huge and allowed me to make a schedule for this year but still in the back of your mind you got to secure your job out here and you can’t take that for granted. I learned that — I didn’t learn it the hard way but very close to learning the hard way in 2012. So that’s kind of been the priority after I got off to such a slow start. Now getting a win I can buy some plane tickets to Maui, moves me up the FedExCup, I think I was told in the Top 25, which is massive. Getting to East Lake is huge and I feel like I have some unfinished business there as well. QUESTION: Second question, your first chance to step on the course as a PGA TOUR winner will be next week. You’re playing with Gary Woodland. Tell me about how much you’re looking forward to playing with him and the format of the tournament next week. CHAPPELL: Just excited to get to tee it up with a friend. Gary and I have known each other for a long time. Had a lot of fun together. He’s a friend going through a tough time and hopefully we can have some laughs and enjoy the format. As things progressed with that event, you know, had more and more appeal, one of those things that you’d be kicking yourself if you missed it and it goes off the way it’s going to go off and so Gary and I at the Shark Shootout mentioned to it each other and he didn’t have a partner, I didn’t have a partner, either. Let’s put it on the back burner for now. Talk in the spring. If it fits, great, if not, no worries. Obviously it fits and I’m excited to tee it and try and get another trophy. QUESTION: Kevin, all those runner-ups and you in the playoffs quite a bit, was there ever a point where you got discouraged at all or was it all positives or how did you kind of put everything in perspective there? CHAPPELL: I wouldn’t say the near misses got me discouraged. I was always encouraged by my play and all six of the second place finishes. One thing I didn’t do a good job of was enjoy those very much. And so when I was or when I do struggle I really am miserable and I think that’s what the key to today moving forward is, is really enjoy this moment and enjoy being a PGA TOUR winner because there’s no guarantees out here, and it will make the struggle a little bit easier I think moving forward. MODERATOR: All right. Kevin, congratulations.